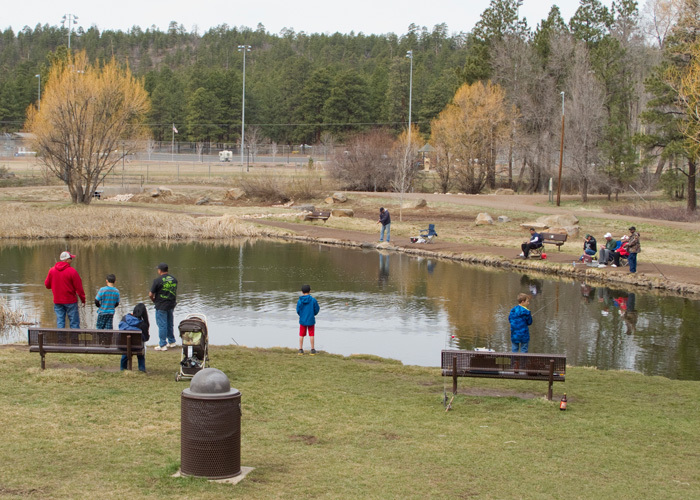 People fishing and enjoying the water at Frances Short Pond along the Rio de Flag, Flagstaff. Photo courteous of Tom Bean Photography. Description: What are your experiences with the Rio de Flag? How often do you cycle or walk your dog on the FUTS that parallels the Rio? What are the benefits the Rio provides and some of its issues? Join us on Thursday, May 3rd as we hear from Chelsea Silva, Executive Director with Friends of the Rio, who will share results from a survey of Flagstaff Area residents’ experiences with the Rio de Flag. Friends of the Rio partnered with the City of Flagstaff and Coconino County to release this survey on the City’s Peak Democracy platform. Over 200 residents provided input through comments and placing points on a map to show recreation and restoration needs throughout the watershed. Thank you to the Arizona Community Foundation for supporting this project! Chelsea earned her Masters in Environmental Sciences & Policy from Northern Arizona University in 2016. During her studies, she began volunteering with the Friends of the Rio. She currently serves as an AmeriCorps STEM VISTA with the organization, working to build capacity through fundraising, partnership building, and event coordination. 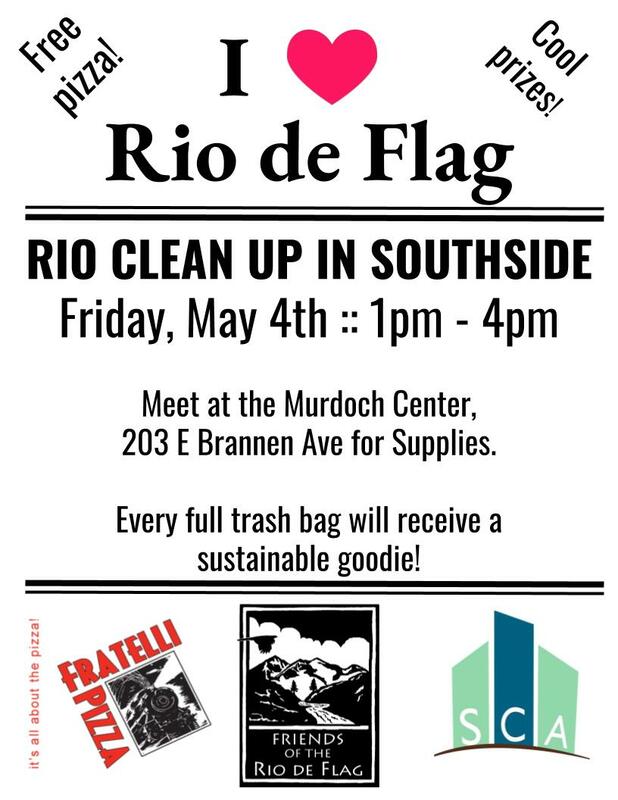 Join us for a fun cleanup event on Friday, May 4th! You’re Invited to NAU’s First Annual Student Water Symposium! 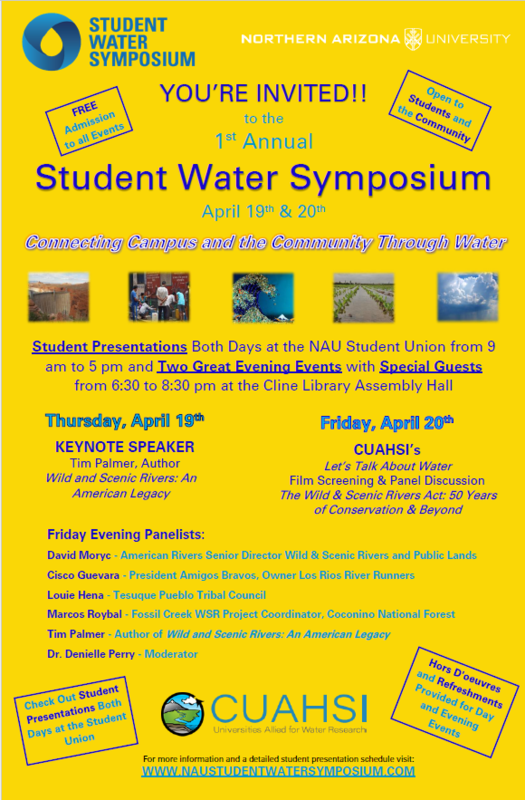 You are invited to Northern Arizona University’s First Annual Student Water Symposium on April 19th-20th. The event offers both graduate and undergraduate students at NAU an opportunity to present water-related research and collaborate across disciplines, shaping them as the next generation of water policy-makers, managers, and stewards. Moreover, the symposium acts as a venue to connect campus and the greater Flagstaff community through water by offering two evening events centered around the theme: The Wild & Scenic Rivers Act: 50 Years of Conservation & Beyond. Thursday evening features a talk and presentation by special guest, Tim Palmer, author of Wild and Scenic Rivers: An American Legacy. Friday evening presents a screening of three short films by American Rivers followed by a panel discussion with river conservation professionals. Both evening events are free admission to the public and promise to enlighten and inspire the audience. Please visit their website www.naustudentwatersymposium.com details regarding evening events, a detailed list of featured panelists, and the student presentation schedule. Hors d’oeuvres will be available at all events.